I was at Nigel’s Beauty Emporium a few days ago, because I needed to replace the mascara in my kit. That is when I discovered that Make Up For Ever’s Aqua Smoky Lash mascara is the bomb, yo! It really delivers on its promises: volume, length and curl. I was pleasantly surprised when I tried a bit on myself (with a disposable wand, of course). 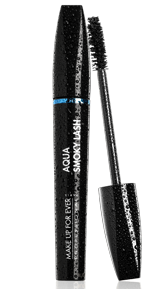 Aqua Smoky Lash is the waterproof version of Smoky Lash. As you can see below, my lashes are not supa-dupa long, but they are fuller with a bit of a curl (sans lash curler, saving me some time). 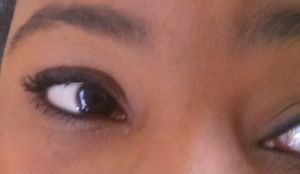 Plus, my bottom lashes, which are normally nonexistent, actually show up in the picture. And this is with just two coats! Make Up For Ever’s Aqua Smoky Lash mascara comes in black and retails for $22.